New regulations have been approved to allow recreational snowmobilers to enjoy designated trails on Crown land. 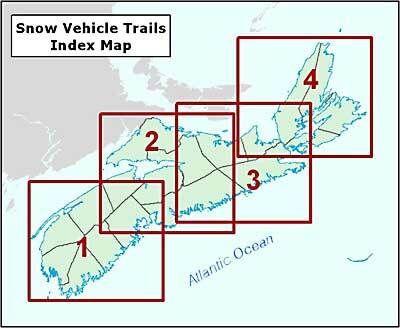 The Department of Natural Resources has mandated the Snowmobilers Association of Nova Scotia (SANS) to sell permits to ride on designated snow vehicle trails throughout the province. All designated trails will be signed with official signs. Designated trails for the 2013-2014 season are the same as those that were designated for the previous season. The maps provided below are current for the 2013-14 season. In order to legally use a designated trail, snowmobilers must purchase a Trail Permit from SANS to affix to their snow vehicles.